There is always something going on in the garden! It pays to keep your eyes open when you spend time in the garden! I am never quite sure what I will find. It pleases me to think of the mini ecosystem the garden is supporting. I came across this stick insect in the front yard while doing some clean up. It’s a variety of walking stick, a California Timemas. They usually live in trees and shrubs in the chapparal or at the foothills of mountains. I don’t know what it was doing in Oakland! This is the first time I have seen one here. Global warming? While cutting parsley I spied this lovely caterpillar. Looking it up on the web I found it is the caterpillar of the Black Swallowtail Butterfly (Papilio polyxenes). In the past it was commonly referred to as the Parsnip Swallowtail as their favorite food plants belong to the Umbelliferae, or Carrot family. They like parsley and fennel, both of which are abundant in my garden. The adult butterfly must have visited my butterfly bush and decided the nearby parsley was a good place to lay its eggs. After photographing and identifying it, I returned it to the parsley. There is plenty to share. 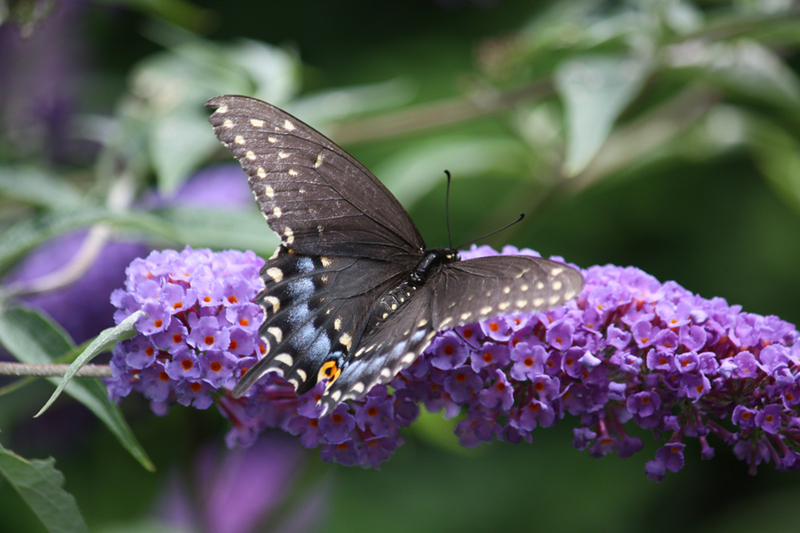 Black Swallowtail Butterfly. Photo by Peter Miller. And, asparagus growing in with the chard?! In October! This one must have seeded itself from the asparagus bed which is a good 50 feet away.